We got a little snow here Saturday night, I didn't have an opportunity to get out with my camera yesterday. It was really beautiful here. I had the opportunity today, so I went out this morning at sunrise. Unfortunately, it was overcast with a few pokes of brightening every now and then so I didn't have good light or skies to work with. 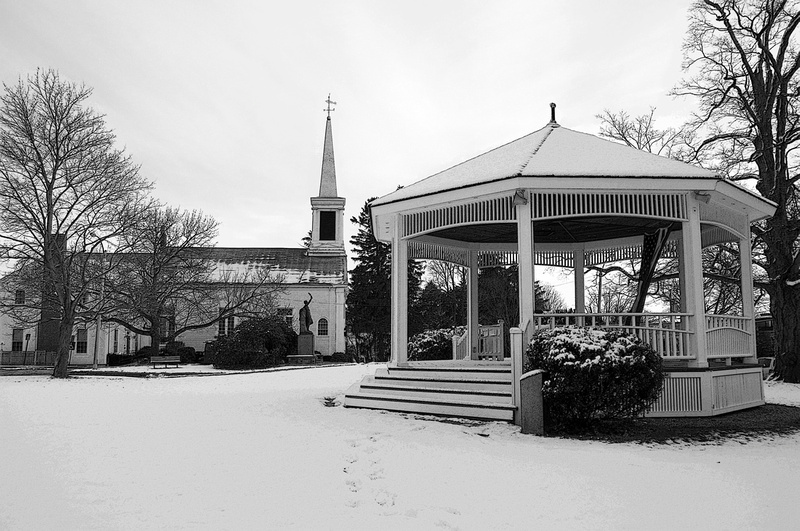 Here is a church and gazebo in Milton MA. Please tell me which shot, if any, you prefer, and also any critiques are welcomed. I know many of us wanted to keep this forum active during the foliage off season, so it would be great to hear from you and I hope you will also post some winter scenes from your areas when you get any. I'd love to see them! Hopefully, there will be lots to share! We have a winter storm watch for tomorrow here in Minnesota. To date we haven't had any meaningful snow. That could change tomorrow. Of course I won't be here for it. I'm on my way to Tennessee and South Carolina. Hopefully we'll get some nice snow and it will stay. With high temperatures in the teens and lows near zero it should. I like all of the church photos but I think I like the second photo best. I like the low angle of view. I might have preferred it if you would have moved a little more to the left and got more of the church between the pole of the gazebo but I do like it the way it is. Because of the square format, you must have already cropped it. I like the second reflection photo better. I can't say why, exactly, but I do. Hi Carol: I like the first shot of the town green with the church and gazebo. This is an iconic New England winter scene and as you know, I wrote the SOV blog on town greens awhile back and this blissful setting is one of the reasons I love New England so much. I should say that this shot stands out as I look at it from a purely enjoyable viewpoint. I must say it is beautiful. I think it could even appear on a postcard that I have seen in many Vermont stores. 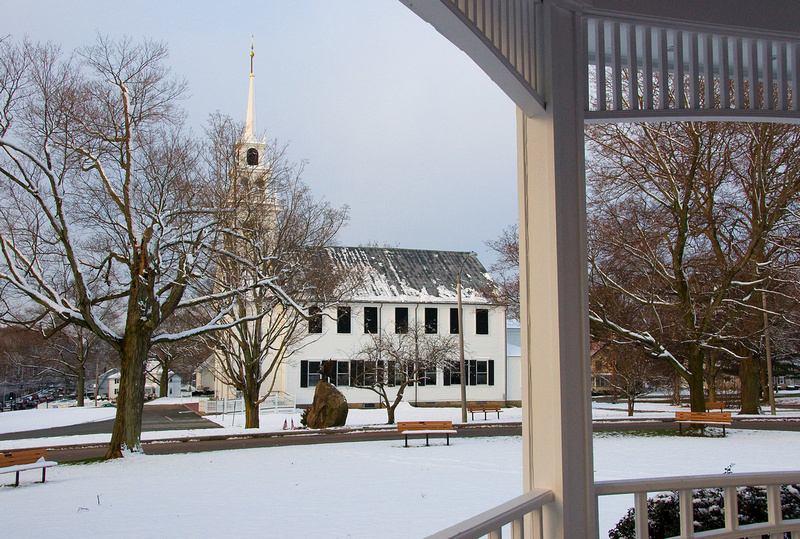 Can you picture yourself walking across the crunchy snow and sitting in the gazebo watching the flakes come down? Do know that some of us see your shots from a different perspective - pure enjoyment! Obviously, I'm not in any position to critique! P.S. They had forecast 3-6 and all we had was spitting snow and a sprinkling on the ground. So the green grass is still very visible. A mess of a storm is on the way for tonight and tomorrow so you will have more snow photo sessions to look forward to! I look forward to more of your lovely New England scenics! autzig wrote: We have a winter storm watch for tomorrow here in Minnesota. To date we haven't had any meaningful snow. That could change tomorrow. Of course I won't be here for it. I'm on my way to Tennessee and South Carolina. Hopefully we'll get some nice snow and it will stay. With high temperatures in the teens and lows near zero it should. Well that answers that question Al. When I replied to your email last night, I asked if you were traveling or home.......now I see you are traveling today. Sorry you will miss the first snowfall in your area, but as you said, with the cold up there, it should stick around. Thanks for your opinion on the church photo. I see what you mean about the perspective. I can always go back another time and try your suggestion, so thank you for that. I thought of you when I was out taking these photos, as I absolutley remembered your love of the Vermont town greens. My son bought me a beautiful book for my birthday titled "South Shore Wide" by Arthur P Richmond. It is a book of panoramic photos taken from the different towns of the South Shore, where I live. In it, was a panoramic shot of the Milton Town Green. I had never been to this spot before, so I headed there early yesterday morning, inspired from the photo in the book, and tried shooting from several different perspectives. Thanks for your opinion on the first shot. I appreciate it. There could be 100 people looking at those 3 photos, and it could be a 3 way equal decision on the favorite. It's all subjective, and what pleases us personally. I think it's fun getting other's opinions. Al liked the second, you liked the first, and I actually was leaning towards the third! Thanks a bunch CT!!! Try to stay warm and dry tomorrow. Nice Carol! I like the first one the best as well. We had an early snow in NJ also. Probably the same storm. 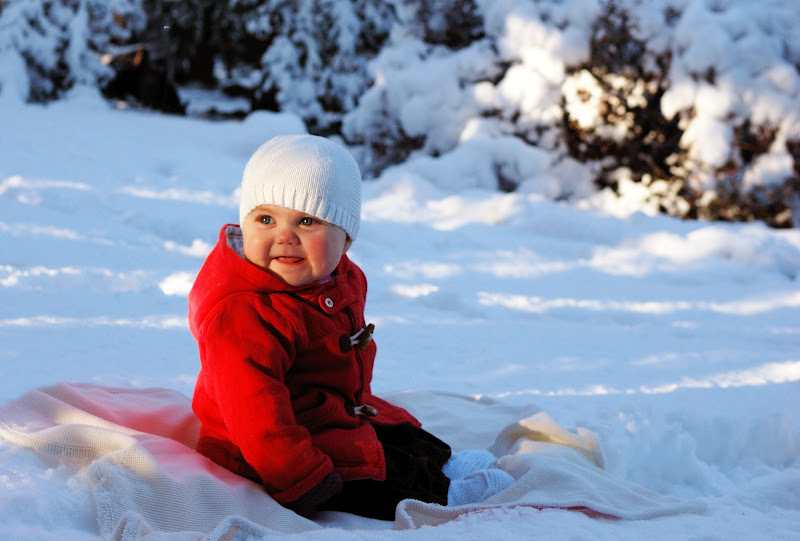 My wife and I took advantage of it to get our Christmas card shot of our daughter. Kids provide quite a challenge.... photographically and otherwise! But I was really happy with the way they came out. Hey Fax: These photos show the true definition of PRECIOUS!!!! Your daughter is adorable! Thanks for posting! We had quite a nasty mess here today. Heavy, beautiful snow in the a.m. and pure, disgusting slush to follow. All will freeze now. We are now having a thunderstorm with hail! 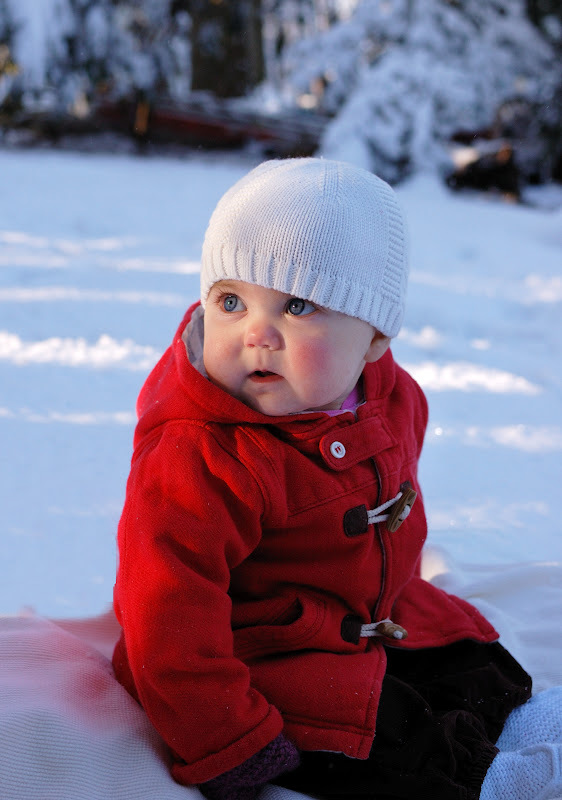 In a related topic, David Middleton blogged today about what makes a good winter photo. He suggests that the early winter is the best time. So I'd better get up to Vermont soon! Your little girl is getting big! She looks so much bigger than she did in the Owls Head photo. Those big beautiful eyes of hers are a photographers dream! I can only imagine how many gorgeous photos you must have of her....and will be taking in the future. She is precious beyond words and I'm so glad you shared these photos with us. Thanks for the smile she brought to my face! I'm glad to know you also like my photo number one. Thanks for that. I also just visited David Middleton's blog. I have been so unlucky the past several years. I haven't hit my VT trips to coincide with any snowfall. Therefore, I haven't had much luck with my VT winter photos at all because the snow hasn't been on the trees. I am hoping my luck changes this year. Well, Carol, critique is easy -- we all get to sit on the sidelines after you went out and braved the cold and wet, and tell what what we would have done, all of course with the benefit of 20/20 hindsight. So here I go . . . . . I, too, like the first one. But I do agree with Al. I would like to see a little more separation between the church and gazebo, if that is possible. You might have to use your ambulatory zoom lens for that . It might also benefit if, by moving to the right a bit it would allow you to exclude some of the empty space on the right of the photograph. I assume you are close to home, here? One benefit to that might be to go back and see what other possibilities there are. I cannot tell you how many times over the years, I have come home, reviewed my shots, and realized the one(s) I MISSED! In this case, you might even go back and take a series of shots for composition placement, no matter what the weather, and find the best one, then wait for the right day, and go back and get the shot with all the conditions right. I have done that -- but rarely do I find a photo op close to home that motivates me that much. .
A couple of the others remind me of another important point. When we start using wider lenses, perspective distortion starts to show up. The lens, no matter how good, has trouble rendering straight lines. You can correct for this to an exent with camera angle and height. But there are physical limits. I always notice it when there is a roof line and a steeple, tower, etc. I have struggled with it on my lighthouse shots. Sometimes, you just have to make a choice whether it is more important for the horizontal or the vertical to be "true" and let the other part just "fall" as it does. I'll have to put an ambulatory zoom lens on my Christmas Wish List Andy. That should keep my husband busy for a while looking for one of those. Or perhaps I could use my Go Go Gadget arms to manually zoom and focus that shot. I see what you mean and appreciate the feedback. I can pop by there anytime....it's about 25 minutes from my home........and try to rework it. I would proabably need to step more to the right. I can try to get some more seperation between the gazeebo and church but not sure it it's possible, but am always willing to try. I think it makes a nice winter scene and will head back there after a future snowfall. Again, there's not much seperation between the gazeebo and church. I am thinking about maybe submitting this in the b&w category in next month's camera club competition. Any comments? Of course I recognize that I have not been to the scene and moving your shooting point might actually introduce more probems than solutions. The only point was I would like to see more separation. Only you will know if that's possible. Any possibilities of a Pano with both churches? Also, looks like you might be able to "tease" a little more drama out of the skies? Gee, a pano would be amazing Andy, but not sure if it's possible. I still haven't attempted any panos yet. I wanted to try one in Maine but I forgot that was one of the things I wanted to do. (short term memory problems) What is the most number of photos that could be stitched together? It would take an awful lot of photos to get the whole scene.